Animation is a powerful tool to debug, test and demonstrate simulations. 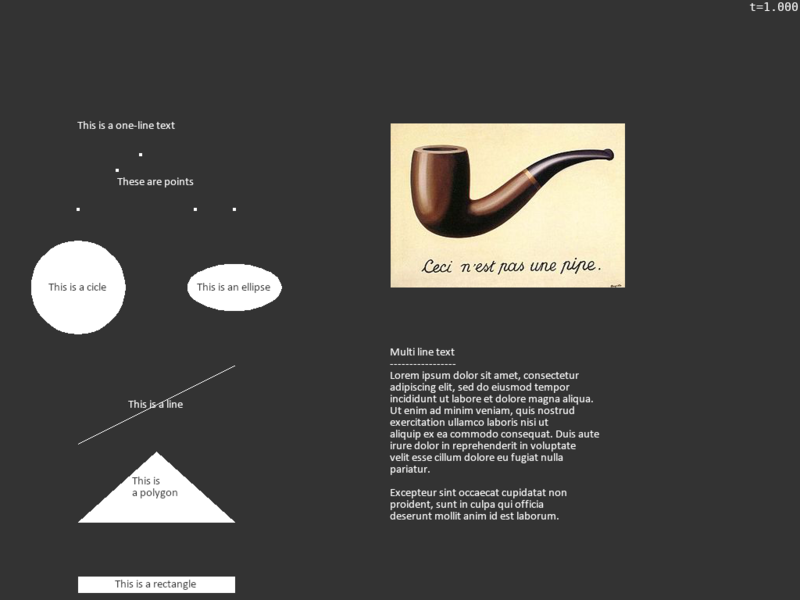 It is possible to show a number of shapes (lines, rectangles, circles, etc), texts as well (images) in a window. These objects can be dynamically updated. Monitors may be animated by showing the current value against the time. Furthermore the components in a queue may be shown in a highly customizable way. As text animation may be dynamically updated, it is even possible to show the current state, (monitor) statistics, etc. in the animation windows. Salabim’s animation engine also allows some user input. It is important to realize that animation calls can be still given when animation is actually off. In that case, there is hardly any impact on the performance. In synchronized mode, one time unit in the simulation can correspond to any period in real time, e.g. The most common way to start an animation is by calling `` env.animate(True)`` or with a call to animation_parameters. Animations can be started en stopped during execution (i.e. run). When main is active, the animation is always stopped. The animation uses a coordinate system that -by default- is in screen pixels. The lower left corner is (0,0). But, the user can change both the coordinate of the lower left corner (translation) as well as set the x-coordinate of the lower right hand corner (scaling). Note that x- and y-scaling are always the same. Furthermore, it is possible to specify the colour of the background with animation_parameters. Prior to version 2.3.0 there was actually just one animation object class: Animate. This interface is described later as the new animation classes are easier to use and even offer some additional functionality. New style animation classes can be used to put texts, rectangles, polygon, lines, series of points, circles or images on the screen. All types can be connected to an optional text. This program demonstrates the various animation classes available in salabim. Animation of the components of a queue is accomplished with AnimateQueue(). It is possible to use the standard shape of components, which is a rectangle with the sequence number or define your own shape(s). The queue can be build up in west, east, north or south directions. It is possible to limit the number of component shown. 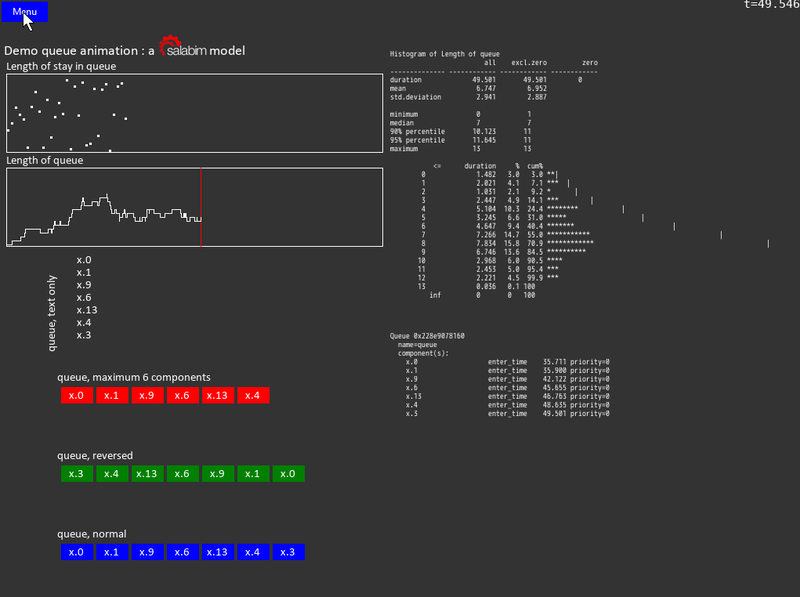 Monitors can be visualized dynamically with AnimateMonitor(). The model simply generates components that enter a queue and leave after a certain time. The various classes have a lot of parameters, like color, line width, font, etc. The function or method is called at each animation frame update (maximum of 30 frames per second). Note that only one type is allowed per instance of Animate. Nearly all attributes of an Animate object are interpolated between time t0 and t1. If t0 is not specified, now() is assumed. If t1 is not specified inf is assumed, which means that the attribute will be the ‘0’ attribute. Animate(t1=env.now()+10,x0=100,y0=100,x1=200,y1=0,rectangle0=(-10,-10,10,10)) will show a square moving from (100,100) to (200,0) in 10 units of time. Animate(t1=env.now(),x0=100,y0=100,x1=200,y1=0,rectangle0=(-10,-10,10,10),rectangle1=(-20,-20,20,20)) will show a moving and growing rectangle. By default, the animation object will not change anymore after t1, but will remain visible. Alternatively, if keep=False is specified, the object will disappear at time t1. 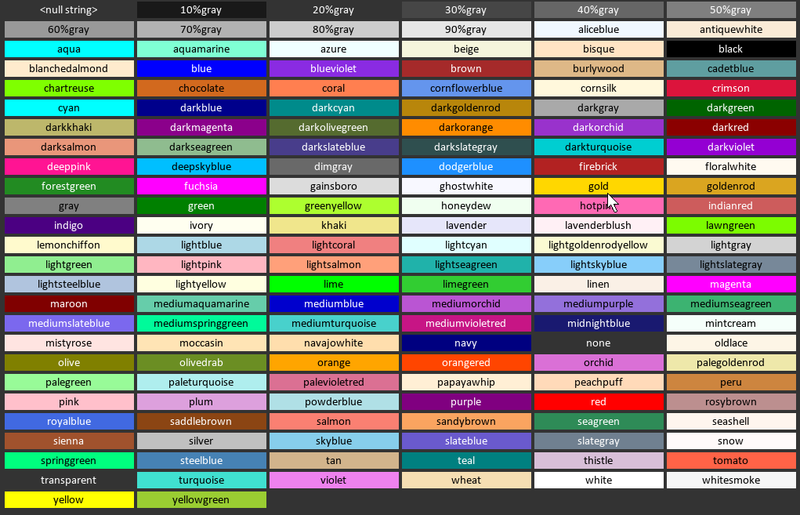 Also, colors, fontsizes, angles can be changed in a linear way over time. Animate(t1=env.now()+10,text='Test',textcolor0='red',textcolor1='blue',angle0=0,angle1=360) will show a rotating text changing from red to blue in 10 units of time. The animation object can be updated with the update method. Here, once again, all the attributes can be specified to change over time. Note that the defaults for the ‘0’ values are the actual values at t=now(). an=Animate(t0=0,t1=10,x0=0,x1=100,y0=0,circle0=(10,),circle1=(20,)) will show a horizontally moving, growing circle. Now, at time t=5, we issue an.update(t1=10,y1=50,circle1=(10,)) Then x0 will be set 50 (halfway 0 an 100) and cicle0 to (15,) (halfway 10 and 20). Thus the circle will shrink to its original size and move vertically from (50,0) to (50,50). This concept is very useful for moving objects whose position and orientation are controlled by the simulation. This code will show the current simulation time moving from left to right, uniformly accelerated. And the text will be shown a bit higher up, every second. It is not necessary to use t0, t1, x0, x1, but is a convenient way of setting attributes. Here we present an example model where the simulation code is completely separated from the animation code. This makes communication and debugging and switching off animation much easier. The example below generates 15 persons starting at time 0, 1, … . These persons enter a queue called q and stay there 15 time units. The animation dashboard shows the first 10 persons in the queue q, along with the length of that q. All animation initialization is in do_animation, where first 10 rectangle and text Animate objects are created. These are classes that are inherited from sim.Animate. The AnimateWaitSquare defines a red rectangle at a specific position in the sim.Animate.__init__() call. Note that normally these squares should be displayed. But, here we have overridden the visible method. If there is no i-th component in the q, the square will be made invisible. Otherwise, it is visible. The AnimateWaitText is more or less defined in a similar way. It defines a text in white at a specific position. Only the text method is overridden and will return the name of the i-th component in the queue, if any. Otherwise the null string will be returned. The length of the queue q could be defined also by subclassing sim.Animate, but here we just make a direct instance of Animate with the null string as the text to be displayed. And then we immediately override the text method with a lambda function. Note that in this case, self is not available! An animation can be recorded as an .mp4 video by sprecifying video=filename in the call to animation_parameters. The effect is that 30 time per second (scaled animation time) a frame is written. In this case, the animation does not run synchronized with the wall clock anymore. Depending on the complexity of the animation, the simulation might run faster of slower than real time. In contrast to an ordinary animation, frames are never skipped. Once control is given back to main, the .mp4 file is closed. It is also possible to create an animated gif file by specifying a .gif file. In that case, repeat and pingpong are additional options. Video production supports also the creation of a series of individual frames, in .jpg, .png, .tiff or .bmp format. By specifying video with one of these extension, the filename will be padded with 6 increasing digits, e.g. Prior to creating the frames, all files matching the specification will be removed, in order to get only the required frames, most likely for post processing with ffmpeg or similar. Note that individual frame video production is available on all platforms, including Pythonista. Salabim also suppports taking a snapshot of an animated screen with Environment.snapshot(). © Copyright 2018, Ruud van der Ham.